Sandwiched between the coupons, department-store flyers and comics, the little newsmagazine tucked into the Sunday paper has long been a staple of American households. And even with the rise of online publishing and the decline of newspapers, a robust market for these publications still exists in many parts of the country, particularly rural areas. What’s more, the online versions of these publications are healthy and draw a strong readership. 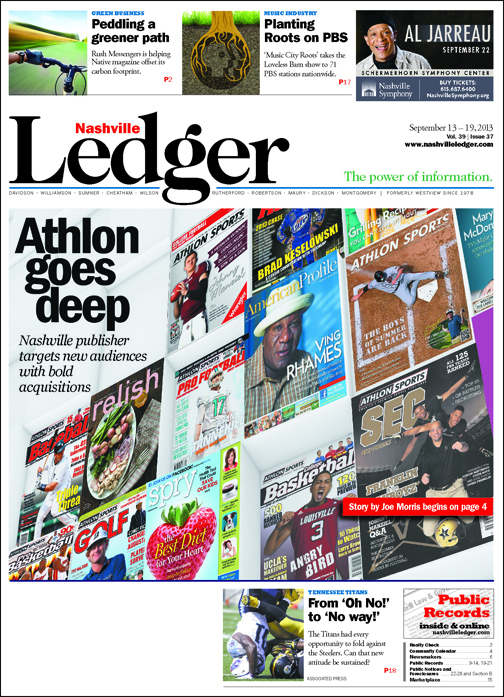 That value is what led Nashville-based Athlon Sports Communications, whose Athlon Sports Magazine has grown to a circulation of 9.3 million monthly copies since its launch in 2010, to acquire PGOA Media’s print publications, which reach 34 million readers through American Profile, Relish and Spry magazines. And now that the two have blended their offerings, the intent is to create a print and digital powerhouse that offers multiple platforms for both advertisers and readers. The deal, announced in July, was structured as an asset purchase. Athlon took over the print brands of PGOA, and all the assets associated with its online American Profile Community Network, which has some 41 million unique online visits each month. Staff and content associated with the print products moved over to Athlon. Now PGOA is to strengthen its focus on the digital side of those print properties, as well as others, including moneyliving.com, dailyparent.com and the Relish Daily Dish mobile app and tablet edition. PGOA might also play a role in Athlon’s existing online content, including athlonsports.com, a provider of daily sports coverage and contests, as well as new ventures. And a new digital entity, set to launch this fall, will be known as the Athlon Sports Community Network. When millions of weekly magazines must be printed, how do Athlon and PGOA get it done? They diversify. About 70 percent of PGOA publications are printed at Donnelley & Sons in Gallatin, while the remainder is printed in Reno, Nev., for distribution to western states. Athlon Sports prints 9.3 million copies per month in Franklin, KY, and another 2 million in Pennsylvania for distribution in northern states. The move to combine markets and products boosts Athlon’s print output to more than 43 million copies across 1,600 newspapers with its four print products and 88 titles overall. “Obviously, the big players are Parade, Conde Nast and USA Weekend, but now Athlon Media Group has moved into that space,” says Chuck Allen, executive vice president and chief operating officer of Athlon Media Group. “When American Profile was launched back in 1999, PGOA created a unique model. They went to C and D markets, which are the more rural counties, where the other companies were in the A and B markets, the cities. “That’s made American Profile a very unique product. “That market is hard to reach but has a higher distribution cost because of that. The two will work together to form a new entity, Athlon Media Group, which will provide integrated marketing across print and digital platforms for advertising and newspaper partners, as well as consumers. The agreement gives PGOA entrée into hundreds of new markets and provides Athlon with a ready-made set of platforms for the female demographic it was not reaching through its sports publication. The trick will be to fully capitalize on all the angles the new reach provides, say the leaders of each company. By combining resources, Athlon Sports and PGOA Media both bring well-known print and digital titles to form a massive new publishing entity. Athlon Sports Monthly magazine: Circulation of 9.3 million monthly. Distributed at more than 60,000 newsstand locations throughout the United States and in 35 countries. Serves business-to-business and business-to-consumer clients as a publisher, content provider and sports marketer through its portfolio of newspaper partners, websites, sports magazines, direct marketing services, retail activation programs and events. The titles have a combined circulation of 34 million in more than 1,600 local-market newspapers across the country. American Profile, its 12-year-old flagship, has a weekly circulation of 10 million. Relish, with a monthly circulation of 15 million and Spry, with 9 million, are respectively the largest advertising-supported food and health and wellness magazines in the United States. American Profile Community Network, composed of 500 websites reaching consumers on an ultra-local level. The national Relish Cooking Show, a series of live, local-market events. Print, digital and event platforms deliver more than 180 million consumer impressions each month. “We had a fairly flat-level revenue business in terms of our print, but we had launched a digital side with a fairly high trajectory,” says John Cobb, chief executive officer of PGOA Media. “We had two businesses with two very different personnel and management needs. “We talked to a number of potential partners who could help our brands live on in print, but who could also create a lot of integrated advertising packages so we could have the mass outreach for all our platforms. For PGOA, Cobb says, Athlon brought two things to the table: a solid management team and a widely distributed community-newspaper title in markets PGOA did not have access to. For its part, he adds, Athlon got four well-known titles and 1,600 more outlets beyond the 200 or so it already had. “The main reason we picked them is that they were heavily invested not only in a newspaper distribution model, but also in a number of specialty publications,” Cobb says. “It was in our best interest to create a partnership that makes our brands as successful for the long term as possible, but also makes us stronger in terms of advertising packages and promotions. “We also were able to move 27 of our print employees over to Athlon, so we were able to save those jobs,” he adds. On the Athlon side, the thinking is much the same when it comes to the value of creating a single marketing and advertising entity to cover multiple titles. “While print and media in general have faced challenges since the 2009 recession, we find that programs that have strong integrated approaches – print/digital and other capabilities – have the best opportunity to service our advertisers and readers,” says Chuck Allen, executive vice president and chief operating officer of Athlon Media Group. “With our primary focus on print and PGOA’s focus on digital, we feel this will enhance our offering in the marketplace. On the print side of the business American Profile, Relish, and Spry fold nicely into our backend publishing operations and enable our circulation department to integrate our content and other offerings to our 1,600 newspaper partners. Athlon currently is working on integrating all the various distribution elements for the print products, which print at four different plants in Nashville and elsewhere. Then it will be working on creating a sales platform that will let it put all its titles in front of new and existing advertisers so that they can customize how, and where, they want to be seen. Because PGOA products will now be in front of 200 newspaper markets they weren’t before, those efforts will focus on wooing women who may not have looked at a sports magazine, but will find the health and wellness content of Spry, or food tips in Relish, more to their liking. And for Athlon, it will now be able to market its male-heavy sports product in the PGOA markets. To make all that happen, the companies are building the Athlon Media Group Network, which will handle the marketing and sales for all products. Under that entity, however, a lot of different sales tactics will be taking place. “Athlon has been around since 1967, and before 2010 just sold special-interest publications,” Allen says. “We still have those customized programs, as well as a lot of work in sports marketing and events. “Now we will be integrating that kind of selling to female-oriented products by working with Wal-Mart, Kroger and other companies. We have worked with large partners in the past, and can do a lot of unique things with customization. For example, Athlon has worked on many campaigns with Wrangler jeans. The company likes the markets Athlon products are in, which may hold equally true for brands that are more geared to women. The same is true for auto manufacturers, who now will be able to promote more than pickup trucks with a greater audience outreach. “The great part is, it really synergizes both sides of the operation,” Allen says. “We have that in terms of editorial, production, accounting, billing, things like that, but we also have it with very diverse content and delivery platforms.